After six Evernote notes, three great ideas for my startup, two epiphanies and grabbing five great apps I’d never heard of, I’m through with the first two chapters (of 11!) 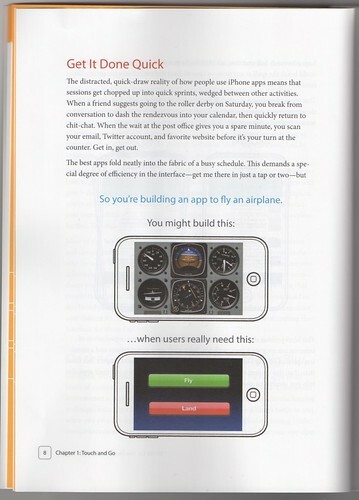 of the brand new book Tapworthy: Designing Great iPhone Apps by Josh Clark. I don’t know which is going to give out first – my brain from all the great ideas, insights, and examples Josh has in his book or my budget for new Apple iPhone apps. Yes, this is a book of chapter, verse, example, and tightly-edited interviews with developers behind some of the biggest iPhone apps. But that’s a disguise. It’s really an awesome set of fresh, up-to-date and useful ways to think about how you design iPhone apps, smartphone apps, desktop apps, web apps, you name it. This is not your typical rehash conventional software interface “best practices” book. What Josh nails is a sea change in what people expect of software apps, especially mobile apps. It’s why Windows smartphones and the like were dead markets for software developers – and why there’s 225,000 iPhone apps and counting. Get this right, and your startup is on the road to fame and fortune. Skip over it, and you miss the boat. This is an interface, big-idea, that’s-why-that-design-works book, not a coding book. Nor is it a “how to market your iPhone app book”. That said, the interviews alone with designers of big important iPhone apps about how they really designed those apps is worth the price many times over. While Sara Peyton at O’Reilly was nice enough to send me a review copy, I’d have bought this book in a New York minute – as a physical book, it’s what a book should be: full gorgeous, color, great content structure, well-written and edited. Looks very interesting, but how come this does not appear to be available in the iBooks store?!?! Thank you for the link, Bob. Not so bad when using a coupon code, and you can then download as either a PDF (works in the latest iBooks), or an epub that you can read using Stanza, which apart from being yet an other book reader, seems to be quite decent). Back to reading tap worthy now, good first impression!